Sturdy, easy to use, professional quality medium format enlarger handles all negative formats up to 6x7cm. The VCCE (Variable Contrast, Constant Exposure) lamphouse simplifies printing on variable contrast papers - you simply dial in the contrast grade desired, while the exposure remains the same at all contrast settings. Dual channels are provided to handle the slightly different requirements of Kodak Polycontrast III RC ( and compatible papers), and Ilford Multigrade III RC (and compatible papers). 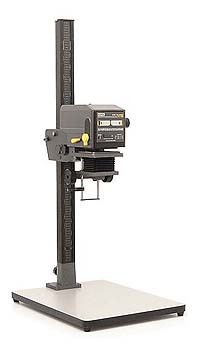 XL aluminum girder allows for enlargements up to 16"x20"
Includes 120V or 220V power supply, 100W 12V enlarging lamp, and one 39mm threaded lensboard. Lenses and negative carriers are not included. For more information on the LPL VC7700 VCCE enlarger and accessories, please refer to our LPL Enlarger Guide.